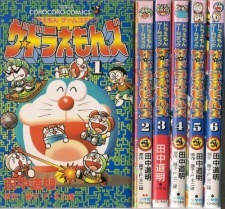 A spin-off of the long-running Doraemon manga, The Doraemons follows the adventures of the six different Doraemon that first appeared in the 3DO game, Doraemon-Legend of Friendship, The Doraemon. The Doraemons, or Dora Dora Seven (DD7), is a kind of an old boys' association of the Robot School which Doraemon attended. All the seven male members are cat-like robots of the same type, enjoy dorayaki, but usually add their own preferred seasoning. They have rock-hard heads they can use as a weapons, or to break out of prison (among other things), but this is even more enhanced in Doraemon, since he has no other special weapons, and has no ears or hat to get in the way when using this mode of attack. The gadget that can connect them is Friendship Telecard. They can call each other with the card everywhere and every time when one or more members are facing problems.